Â You can’t really go wrong with a cookbook from America’s Test Kitchen. Even if their personal preferences aren’t quite identical to yours, the recipes are practally fail-safe and they are very, very well thought out. One of my current – or perhaps I should say “still” as the book has been around for a couple of years -Â ATK favorites is Here in America’s Test KitchenÂ because I like the way that the book groups recipes into categories and includes the tips and reviews that accompanied the recipes when they were featured on the ATK television show. This lasagna recipe is a good one that is made over and over in my family, both for quiet weeknight dinners and for entertaining.Â It’s veryÂ cheesy and has aÂ decent amount of meat in it, where you’ll get some in with every bite, but won’t ever run out of sauce orÂ cheese to go with it. 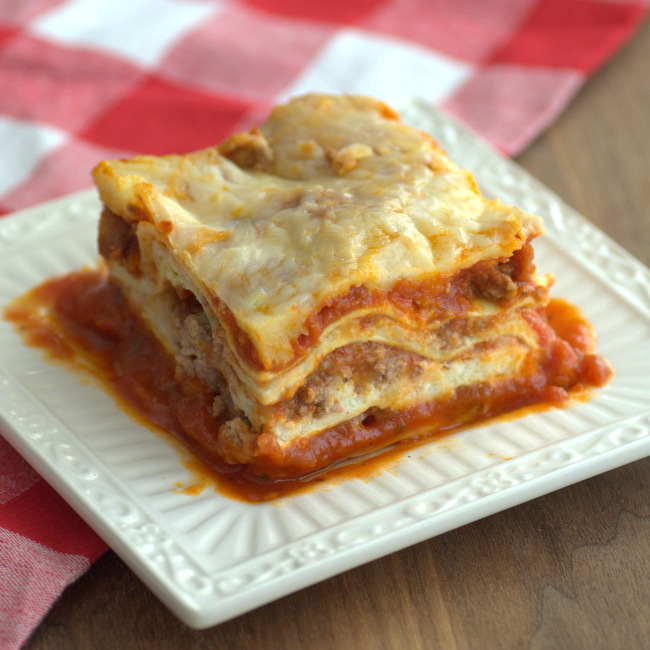 It’s very easy to make, primarily because ATK calls for the use of no-boil lasagna noodles. These noodes require no pre-cooking and can simply be layered into the baking dish along with the cheese; they cook fully (and very reliably) in the oven during baking. The test kitchen recommends two brands as the best: Ronzoni Oven Ready Lasagna and Pasta DeFino No Boil Lasagna. The runner up is Barilla Oven-Ready No Boil Lasagna, if you can’t find either of the other two brands, though they are both very widely available in supermarkets. I cheated on the sauce for this lasagna, so this batch was even easier than your average no-boil batch. TheÂ ATK cookbook includes a recipe for tomato-meat sauce, but I skipped out on it in favor of using jarred sauce. It’s not that I can’t make pasta sauce from scratch, but there are several brands (mostly from TJ’s and Whole Foods) that I like enough to use in just about any pasta dish. For this one, I opted for a combination of traditional, plain maranara sauce and roasted garlic sauce. Try any sauce combination that you like as long as it comes out to about 48-oz. If you make big batches of sauce from time to time and freeze them, this is a great opportunity to pull a container out of the freezer and put it to use. Otherwise, pick up the cookbookÂ and check out the ATK recipe for yourself. In a large saucepan or dutch oven, brown ground beef and sausage meat, breaking up the sausage as you go into small pieces. When meat is cooked, add in tomato sauce and heat through, stirring to evenly distribute the meat. Set aside. In a medium bowl, stir together ricotta cheese, 1 cup Parmesan cheese, basil, egg, salt and pepper. Set aside. Pour 1/4 cup sauce into a 9×13-inch casserole or baking dish and spread to cover evenly. Lay down three lasagna noodles side by side. Spoon 3 tbsp cheese mixture onto each noodle and then sprinkle the layer with 1 cup mozzarella cheese and 1 1/2 cups sauce. Repeat for two more layers. Top lasagna off with final three noodles and the remaining sauce the last cup of mozzarella cheese. 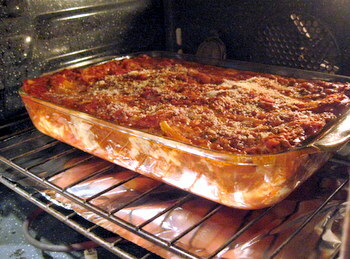 Cover lasagna with aluminum foil and bake for 15 minutes. Remove foil, top with remaining 1/4 cup parmesan cheese, and return to the oven until cheese has melted and is beginning to brown slightly, about 25 minutes. Sauce will be nice and bubbly. Cool for 15 minutes before slicing and serving. *Note: I have also used fresh lasagna noodles in this recipe and it works out just fine. These noodles are typically available in the refrigerated section of stores like TJ’s and Whole Foods, but you may be able to find them at other markets, as well. Your lasagna looks delicious! I have made the one from the Best Light Recipes, and it’s pretty good as well. Yes! I use the same lasagna recipe, and make their sauce too. It’s a bit fussy in that particularly ATK way, but the results are overwhelmingly popular with everyone I’ve served it to.